A graph in 2 shades of blue shows the percentage share of income for the top 1% of earners in New York City (top line, light blue) has risen to about 38% as of 2012. In the U.S. overall (bottom line, dark blue), the top 1% share of income has risen to about 22%. 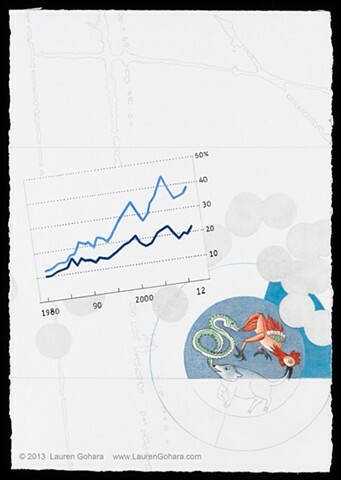 Below and behind the graph, a detail from the Tibetan Buddhist Wheel of Life (pig=ignorance, snake=aversion, rooster=attachment) bridges the lower boundary, and is brightly colored above the line, fading to black-and-white below it. The Wheel itself is partly obscured by dots rendered in graphite. Particle physics tracks streak through the background.